Baked Pork Chops are a classic dinner item. There are several ways to prepare the average pork chop; breaded, fried, seasoned, sauced, and baked are just a few examples. Baked Pork Chops recipe is the perfect solution for when you’re looking for something really easy and different for your dinner. Baking is always a healthier alternative to frying your food, and this dish has simple ingredients that work awesome together. Sort of like a casserole, Baked Pork Chops are extra great for busy days because you are cooking your side dish right along with the main. What you end up with in this dish, is a simply flavored, creamy, hearty meal. If you want to add a little crisp to the pork chops, you can brown them in a skillet before placing in the baking dish. Just season the chops with salt and pepper on both sides, and cook in a hot skillet for a couple minutes per side. You don’t want to cook them all the way through, just enough to get a nice browning on the outside. If you want, you can add in some green beans to the potatoes and onions. This way you can get some other veggies into your meal as well. Baked pork chops are the perfect solution to nights when you don’t feel like doing a lot of preparation and cooking. Place pork chops in a 13×9 inch baking pan. Sprinkle with salt and pepper. 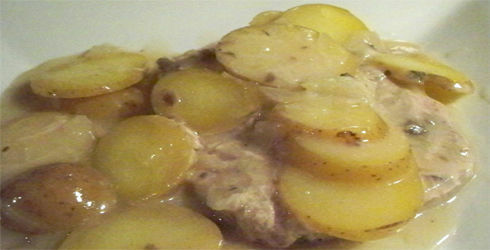 Mix potatoes and onions together; place over chops. Sprinkle again with salt and pepper. In a medium bowl, add milk to cream of mushroom soup. Stir until smooth. Pour over potatoes; cover. Bake for 1 hour. If you like, you can brown the chops before placing in baking dish. I like this article very much. I will definitely be back. Hope that I will be able to go through much more insightful posts then. Is going to be sharing your wisdom with all of my associates!